Mrs. Geneva Kerley Reeves, age 79 of McGrady, passed away Thursday, January 31, 2019 at Wake Forest Baptist -Wilkes Medical Center. Funeral services will be held 3:00 Monday, February 4, 2019 at Stony Fork Baptist Church in Deep Gap with Rev. Phillip Woodring, Rev. Vernon Eller and Rev. Richard Cox officiating. Burial will be in the church cemetery. The family will receive friends from 1:00 until 2:30 prior to the service at the church. Mrs. Reeves was born September 22, 1939 in Alexander County to William Tate Kerley and Mary Jane Estep Kerley. She was a hairdresser. Mrs. Reeves was a member of Stony Fork Baptist Church. 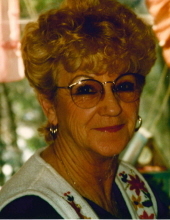 Geneva was a lady of faith, who loved her family and had a passion for cooking and gardening. In addition to her parents, she was preceded in death by a daughter; Regina Rose Spears, two sisters and five brothers. To send flowers or a remembrance gift to the family of Geneva Kerley Reeves, please visit our Tribute Store. "Email Address" would like to share the life celebration of Geneva Kerley Reeves. Click on the "link" to go to share a favorite memory or leave a condolence message for the family.